The idea of the swap is for spinners, felters, and other general fibre artists to swap their stash - and that includes media other than wool tops. Whatever you like to do with it (spin, felt, weave, etc) I'm sure you've got excess stuff you'd like to get rid of, and would love to recieve something different. This is especially good if you've got a huge amount of one color and you just want to mix it up a little. Are you willing to be a swap angel if needed to be? Do you spin, felt, weave, other? Approx how much fibre would like to send? Would you like to prepare a introduction kit for your partner? -What types of kits could you make? 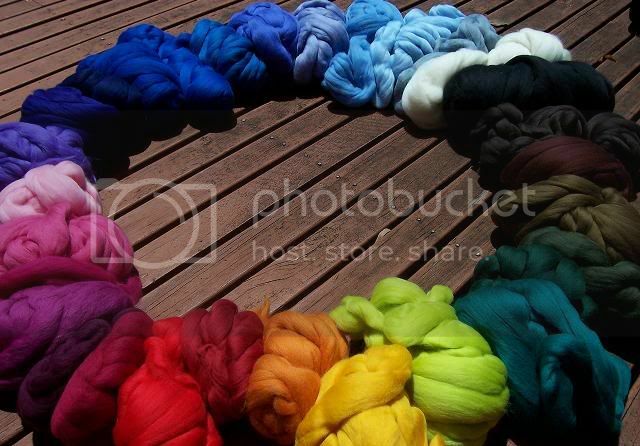 I am going to see how much fibre I have/need for an upcoming craft sale at the end of May- So I will probably have to wait until last minute to sign up.... BUT would LOVE to participate if i have a good amount to share. Can we also include requests for pre-spun fibres and yarns too?! heh-heh I'm glad I'm not the only one. I don't even knit or crochet so its like a tortured type of drooling. lol! While we're having sign-ups, I though it might be fun to share different pics of our stash. I've already shown off this pic in the pre-signups discussion so I've got one more for you. Golly gosh I wish this was my stash, but it's my supplier's stash pic. Large or small, show us your stash! As much as I'd love to be part of this I dont think I can. I do needle felting and recently started knitting but I only have a tiny amount of merino, not even enough to be called a stash lol. Dont know what I could offer, unless I could put together a tiny needle felting kit. Hmmm, will have to give it some thought. i dont have much roving to spare but i've got lots of cool handmade fibres and some angelina (sparkley) that i'd be up for trading! i usually give all my extras to lexis, lol! There are questions in the survey so I can try match people as to what they would like, and what they would like to send.